RATTLED by the adamance of the national leader of the ruling All Progressives Congress, Asiwaju Bola Ahmed Tinubu on the decision to withdraw his support ahead of the governorship Primary, Lagos Governor, Akinwumi Ambode has reportedly shunned entreaties by some Lagos Monarchs who paid him a solidarity visit. According to Punch Newspaper, there were indications on Thursday that, had yet to back down on his decision to find an alternative to the incumbent governor of the state, Akinwunmi Ambode, in the 2019 governorship election. There had been reports that Ambode was no longer in the good books of Tinubu, which political watchers said might cost him his second term as governor. On Tuesday, two new aspirants emerged under the APC umbrella to vie for the governorship ticket with Ambode, blowing open the discord between the governor and his godfather. They are Dr. Obafemi Hamzat and Jide Sanwoolu. The mandate caucus, headed by Tinubu in the APC, had endorsed Sanwoolu, while the chairmen of the 57 councils in the state also gave their backing to the former Lagos commissioner. The development was said to have rattled the governor, his team and the people of the Epe division, where he came from. President Muhammadu Buhari, Oyo State Governor, Abiola Ajimobi; and Oba of Lagos, Rilwan Akiolu, were said to have embarked on a last-minute move to save Ambode. It was gathered on Thursday that after the meeting between Tinubu and Akiolu did not yield any result, the former Lagos State governor was summoned to Abuja. Sources told our correspondents that the meeting was influenced by the wife of the President, Aisha Buhari, who was said to have been called by members of the Committee of Wives of Lagos State Officials, a body currently being headed by the governor’s wife, Bolanle Ambode. Although the details of the meeting remained sketchy as of press time, it was gathered that Tinubu, who flew to Abuja on Wednesday, did not back down from the position of the mandate group that Sanwoolu should become the next governor of Lagos State. 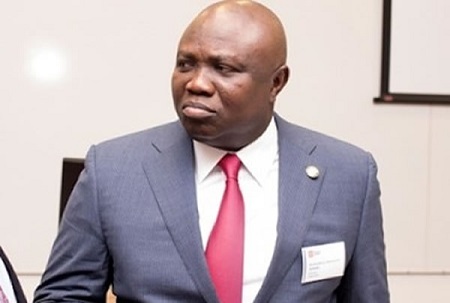 The source said, “The issues are many – alleged sidelining of party elders, the scrapping of PSP waste management initiative, the sacking of highway managers, award of contracts to a few cronies, ignoring advice from party leaders – they are many, and Asiwaju did not see how all could be resolved without Ambode leaving. Meanwhile, in Lagos, Ambode declined to see some monarchs in the state, who had come to pay him a solidarity visit. It was learnt that the monarchs had gathered at the Adeyemi Bero hall in the state secretariat for their regular meeting and had afterwards decided to visit the governor. “But the governor did not see them. He just stayed in his office. Some officials of the government later came to talk to them and they left,” an official, who declined to be named, said. He added that the governor was hopeful that Tinubu would support him, saying that the governor was not ready to fight those who brought him to power.